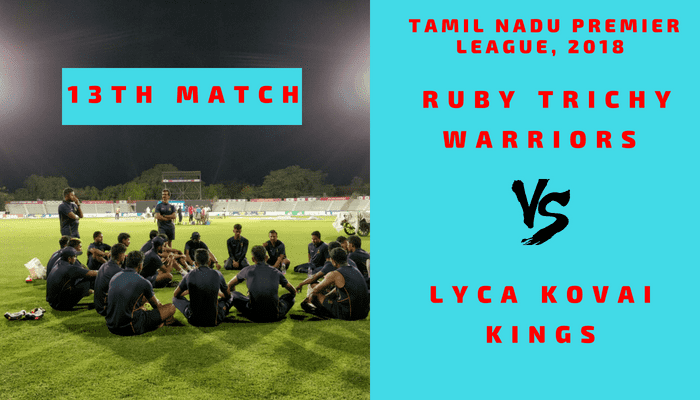 Ruby Trichy Warriors is all set to take on Lyca Kovai Kings on Monday, July 23, 2018. RUB has won their last two fixtures whereas LYC failed to register a win so far in this TNPL. In Today’s Dream11 Fantasy Cricket Match of RUB vs LYC 13th T20, TNPL 2018, we will cover Pitch Report of NPR College Ground, Dindigul, Toss Prediction, Fantasy Cricket News, Probable Playing 11 and Who Will Win? Who Will Win the 13th T20 Match, Between RUB vs LYC and Toss Prediction? Where Can You Watch the Live Streaming of RUB vs LYC, 13th T20I or Channels to Watch? Ruby Trichy Warriors has played two matches and have won both the matches. On the other hand, Lyca Kovai Kings have played three matches and lost two and one game was a tie. RUB seems to be a strong team this season. According to our astrology prediction, LYC will win the match. So far the team batting second have won on this ground. Chasing a score is easy on this ground, so the team winning the toss should opt to bowl first. According to our astrology prediction. LYC will win the toss and ask RUB to bat first. Date: The match will be played on the 23rd of July 2018 (Monday). Match: Tamil Nadu Premier League, 2018, RTW vs LKK, 13th Match. The pitch of Dindigul, NPR College Ground has favoured the batsmen so far in this Tamil Nadu Premier League, 2018. On some occasions, the wicket also favoured the seamers and the spinners. The condition will remain the same on today’s match. The batsmen will be benefited and the bowlers can also take advantage if they bowl in a proper line and length. The weather is expected to be the same as it was in the last couple of days. It will be partly cloudy throughout the day and the sun will play hide and seek. The cricket fans and fantasy users can see the complete game as there is no sign of rain. It is expected to be a hot and humid day. The temperature is expected to be 30-Degree Celsius and the humidity to be 50%. Ruby Trichy Warriors and Lyca Kovai Kings have played twice and the result may make you happy if you are a LYC fan. LYC has won one match and one game was a tie. RUB have failed to win against LYC. In the last encounter, LYC defeated RUB by 7 wickets with 8 balls remaining. Suresh Kumar, Baba Indrajith, and Bharath Shankar are the key performers of Ruby Trichy Warriors Team. Lukman Meriwala and Himmat Singh will not play being outstation players. RUB star player is with India team and he will no be available. They have played their last two games with an unchanged team and they will do the same today also until and unless there is any fitness issue. Suresh Kumar, R Sonu Yadav, Chandrasekar Ganapathy, Kannan Vignesh, Baba Indrajith (c), Lakshmi Narayanan, Bharath Shankar, MS Sanjay, S Aravind, Dakshinamoorthy Kumaran, K Mani Bharathi (wk). Chandrasekar Ganapathy, Aswin Crist, Bharath Shankar, Lakshminarayanan Vignesh, Sathiamoorty Saravanan, R Sonu Yadav, K Mani Bharathi, S Aravind, Govinda Raajan, MS Sanjay, Murali Vijay, RS Thillak, Dakshinamoorthy Kumaran, Suresh Kumar, Lakshmi Narayanan, Baba Indrajith, V Aakash, DT Chandrasekar, Saravan Kumar, Kannan Vignesh. Shahrukh Khan, Akkil Srinaath and Abhinav Mukund are the key performers of Lyca Kovai Kings. Shoraab Dhaliwal and Dharmendra Jadeja will not play being outstation players. LYC has failed to register a win till now and this may lead them to make a couple of changes. Pradosh Ranjan Paul may be dropped for today’s match. Abhinav Mukund (c), Shahrukh Khan, Pradosh Ranjan Paul/Suresh Babu, Ravi Kumar Rohith (wk), Ashwin Venkataraman, Prasanth Rajesh, S Ajith Ram, Krishnamoorthy Vignesh, T Natarajan, Akkil Srinaath, Antony Dhas. T Natarajan, Abhinav Mukund, Muhammed Khan, Ravi Kumar Rohith, Prasanth Rajesh, J Suresh Kumar, Ashwin Venkataraman, Shahrukh Khan, S Manigandan, Antony Dhas, Sumant Jain, S Ajith Ram, R Mithun, Krishnamoorthy Vignesh, Akkil Srinaath, Pradosh Ranjan Paul, R Sathyanarayan, M Raja, Suresh Babu. Fantasy Cricket Expert Tips: Ravi Kumar Rohith is a better option for today’s match. 85.24% of the users have selected RK Rohith in their Dream11 Teams and 14.76% of the users have selected KM Bharathi in their Dream Teams. Make a combination of the above players for multiple teams. Conclusion: This is it for Today’s Dream11 Fantasy Cricket Match Prediction of RUB vs LYC, 13th T20I Match, which will be played on Monday 23rd July. We have covered all the details required to win any fantasy leagues. We have covered players recent and past performance, dream11 guru and crictom prediction, all the latest news and updates of Ruby Trichy Warriors Team and Lyca Kovai Kings Team, weather report of Dindigul, dream 11 best teams, keys players, the best choice for captain and vice-captain, where to watch the live match of RUB vs LYC, 13th T20 Match and the details of live streaming of Tamil Nadu Premier League (TNPL), 2018.